The world number one and two share the lead at the DP World Tour Championship and go head-to-head in the final round tomorrow. THE DP WORLD Tour Championship will go down to the wire after Rory McIlroy and Luke Donald finished in a share of the lead on Saturday. 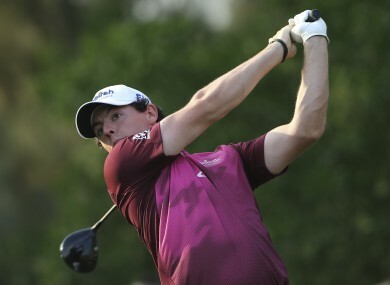 World number one McIlroy and second-ranked Donald carded rounds of six-under 66 to close the third round at 17 under overall at the Jumeirah Golf Estates in Dubai. McIlroy bogeyed the opening hole but was almost faultless from that moment onwards as he hit five birdies and an eagle, while Donald recorded a bogey-free third round to go with his six birdies. The Ryder Cup team-mates are three strokes clear of South African pair Charl Schwartzel and Louis Oosthuizen heading into Sunday’s final round. Schwartzel repeated his second round display with another five-under 67 that saw him jump three places into second alongside Oosthuizen, who shot a four-under 68. Dutchman Joost Luiten and Branden Grace of South Africa are a further two shots adrift at 12 under. Romain Wattel headlines a group of seven golfers in a tie for seventh place. The Frenchman birdied eight holes for a five-under 67 as he moved to 11 under for the tournament. Joining Wattel in seventh are South Africa’s George Coetzee (67), Thongchai Jaidee (68) of Thailand, Welshman Jamie Donaldson (69), Swede Henrik Stenson (69), England’s Justin Rose (69) and Scot Marc Warren (72). Three-time major winner Padraig Harrington birdied his last two holes to finish with a four-under 68 round on day three. Harrington’s effort sees him climb nine spots to 10 under alongside Gonzalo Fdez-Castano (68). Email “McIlroy and Donald set up shoot-out in Dubai”. Feedback on “McIlroy and Donald set up shoot-out in Dubai”.